Set of 9 needle pairs & accessories. US 4 (3.5mm), US 5 (3.75mm), US 6 (4.0mm), US 7 (4.5mm), US 8 (5.0mm), US 9 (5.5mm), US 10 (6.0mm), US 10.5 (6.5mm), US 11 (8.0mm) in Clear Vinyl Case containing 4 Cords (to make 24"""", 40"""", & 2 of 32"""") 1 Set of size markers, 8 End caps, 4 Cord keys, 1 Cord case. 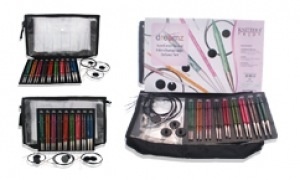 Thoughtfully packaged set includes needles in the 9 most useful sizes plus cords in a variety of lengths. Radiant color assortment for easy identification. Lightweight, strong & durable needles. Perfect points, flawlessly tapered - ideal for all yarns and every project. A polished wood surface works effortlessly with every type of yarn without slowing down knitting rhythm. Easy to connect cord with a smooth join that enables stitches to glide easily ñ no snag! Resilient, flexible cords lay flat, with no kink or twist ñ easy to store. Comes in a convenient to store and carry case, made of clear vinyl case. The case has a zipper top and 7 pockets on each side for needle storage. Plenty of extra room for tools or small projects! One extra clear vinyl cord case also provided. The knitter's favorite needle: Providing hours of pleasurable knitting with no hand fatigue.